The Tenement: TIME for an update.. This is what I've been working on today. It's a Mini Mundas kit but I've slightly altered the face and have revamped the case. I wanted it to look as if it had marquetry panels on it and overall I'm pleased with the way it turned out. 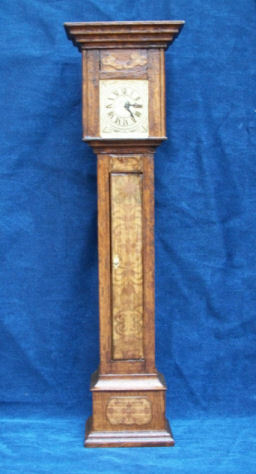 This clock will be in the Little Chamber that I'm working on at the moment. It is thought that this floor was occupied by Sir James Creichton of Fiendraucht, Kt but there is nothing to indicate what purpose the little room was put to. Your marquetry effect looks very realistic, it is great! Wow that looks really great. The clock looks great Irene, I bought a mini mundus grandfather clock kit at Scottish Miniatura and hope I make it look half as nice as yours ! The clock looks lovely - great effect. The result is very good. Whatever you've done to it, Irene, it looks marvellous! The marquetry effect emphasises the simple structure beautifully. I really love this. Only just found this post - I think that some post notifications are not getting through lately. The clock is excellent, Irene - elegant simplicity - which is what you do so very well! !